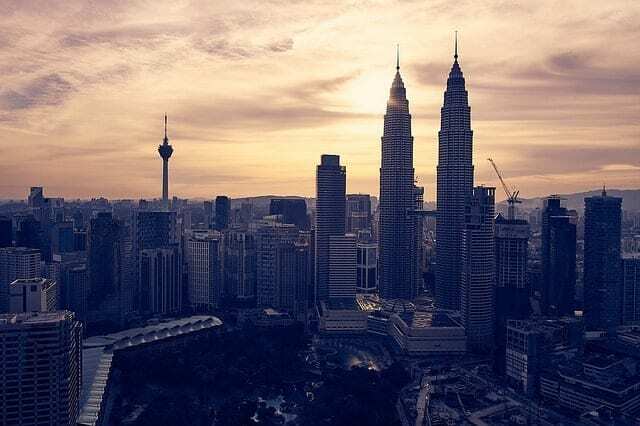 Kuala Lumpur travel guide contains all the necessary tips and suggestions for the benefit of first-time travelers interested in visiting the capital of Malaysia. 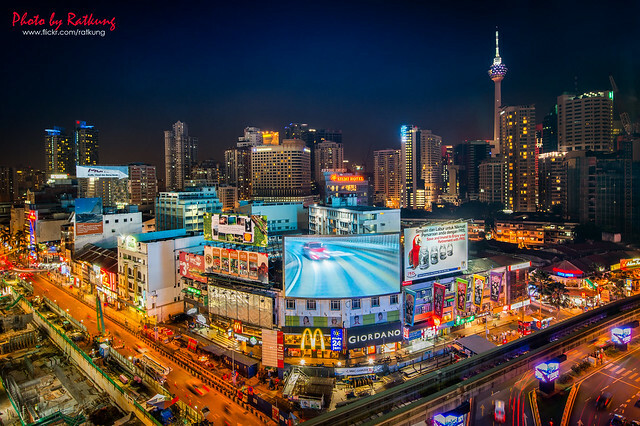 Kuala Lumpur is one of the ten most visited cities in the world having received 12.58 million international visitors in 2017. This only indicates the popularity of this great Asian city with travelers from around the world. The currency used in Malaysia is the Malaysian Ringgit. 1 USD = approximately 4 RM. The currency is also depicted as ‘MYR’. Kuala Lumpur has a tropical climate. Hence, it is hot and humid through most part of the year. Since the city lies close to the Equator, it has a constant temperature and rains almost throughout the year. Please carry raincoats and umbrellas with you no matter when you travel. The chart might seem confusing, hence to give a brief summary, the best time to enjoy Kuala Lumpur is May to July and December to February. How to reach Kuala Lumpur? Kuala Lumpur International Airport with airport code KUL receives international flights from around the world all through the day. 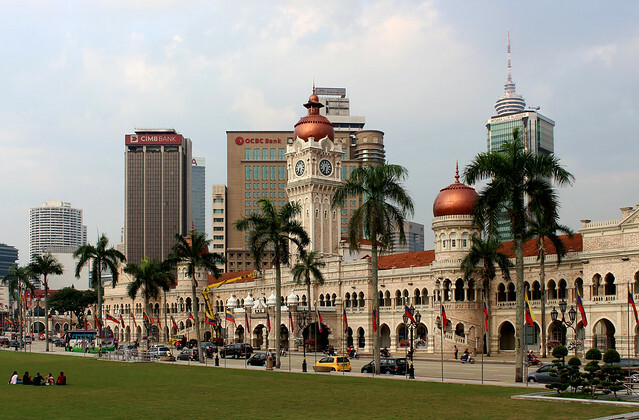 You can reach Kuala Lumpur by land from Singapore and Thailand vis bus, train, or car. In addition, there are cruise ships which sail in this region stopping by in Thailand and Singapore. 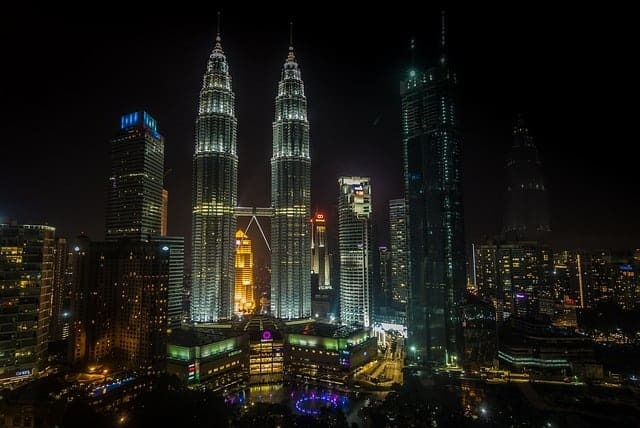 How to reach Kuala Lumpur city center from the airport? The airport is located in Sepang District of Selangor, approximately 45 kilometers south of Kuala Lumpur city center. The KL hop-on-hop-off buses offer a good deal to go sightseeing. The 24-hour ticket costs RM 50 (USD 12) and 48-hour ticket costs RM 90 (USD 22) per adult. Check out their website, for more info. There are pedestrian walkways and bridges for the benefit of people who love to explore the city by foot. In additin, most of these walkways are under the shade of trees which makes it a pleasant experience. The quintessential Malaysian symbol. The twin towers have 88 floors and holds the distinction of being the tallest twin towers in the world. It’s important to book in advance if you wanted to go on top of the tower and its closed on Mondays. The ambiance of the place in the evening is pleasant. In addition, the towers are lit up and the and water fountain is amazing. Carry your wide angle lens to capture the entirety of this skyscraper in your camera. Also, see if you want to walk across the street to get good vantage points to click pictures. Buy the tickets online to avoid wasting time in queues. International travelers need to shell out RM 80 (USD 20) to go up the towers, cross the Skybridge, and spend time in the observation deck. Try to visit the towers twice, once in the morning and once in the night to appreciate the skyline better. A communication tower measuring 421 m tall including the antenna. For 50 RM (USD 12) you can go to the observation deck on the topmost floor. The panoramic views of the city are spectacular. If possible, visit the deck during dusk to witness a beautiful sunset. In addition, if you have nerves of steel, then you can walk in the ‘Skybox’, which is a box entirely made of glass high above the ground. Not for people suffering from vertigo. 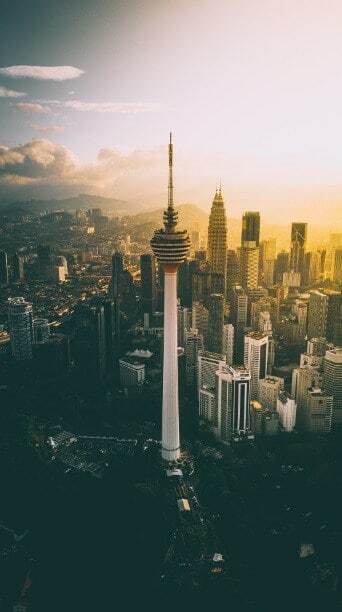 Every year in the month of August (might change), the KL Tower International Towerthon Challenge takes place where participants need to climb the stairs and reach the topmost floor by foot. The champion who clocks the best time wins 4000 RM (USD 1000). This is a historical place for every Malaysian. It is in this square where the colonial Britisher’s Union Flag was lowered and the Malayan flag was hoisted for the very first time at the stroke of midnight of 31st August 1957. There is a flagpole here which is considered to one of the tallest in the world and other small fountains. Overall, a nice place to spend the evening on the neatly manicured lawn and take pictures. This historic building originally housed the offices of the British colonial administration until independence. It is located right beside Merdeka Square. 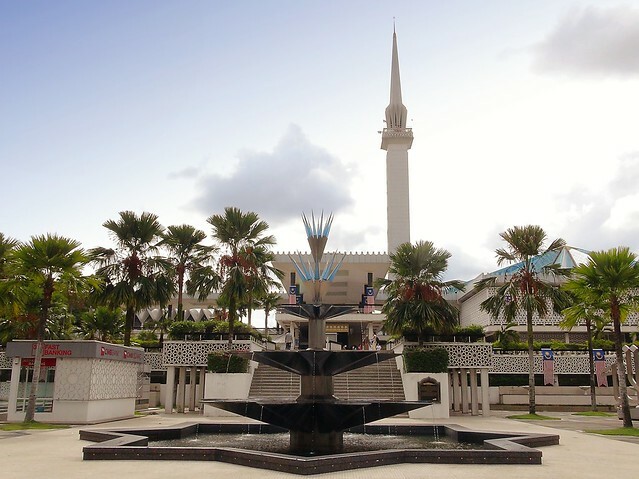 This huge mosque with a minaret measuring 73 m high can seat up to 15,000 people at once. Extremely beautiful to appreciate the architecture and the beliefs of devotees who come here to pray. The perimeter of the mosque is covered by gardens. Non-muslims are allowed entry. However, female travelers need to put a scarf or a stole over their head as per religious customs. Please dress appropriately if you have plans of entering the mosque. Also known as the Sultan Abdul Samad Jamek Mosque, this is the oldest mosque in the city which was opened in 1909. A tourist hub teeming with shops selling handicrafts, clothes, jewelry, street food, and much more. In addition, a great place to buy souvenirs. There is the Central Market Annexe right behind the market where there are many art galleries. Consequently, the best place to appreciate the local art scene. Just 13 km north of Kuala Lumpur are the Batu Caves. 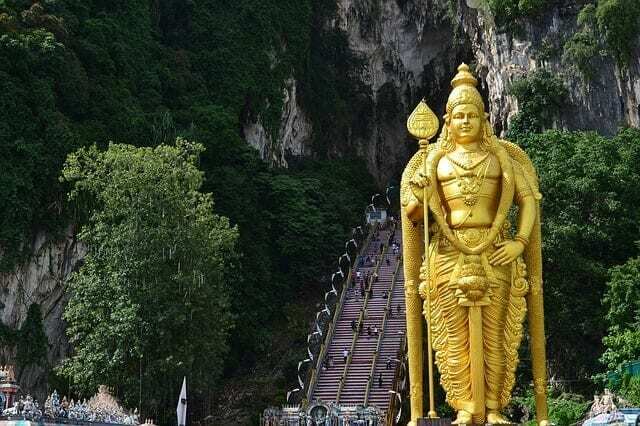 You need to climb 272 stairs to reach the top of the hill to see the larger than life statue of the Hindu God, Lord Murugan. The naturally formed limestone caves are spectacular. Photography enthusiasts will fall in love with this place. 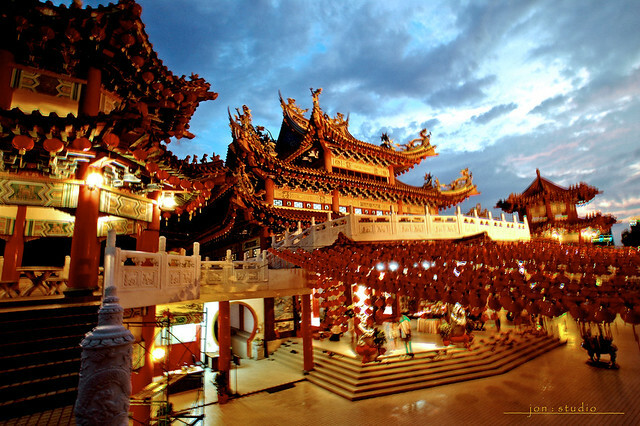 This 6-tiered Chinese temple dedicated to the sea goddess Mazu has a fascinating architecture. Similarly, it is a delight to visit this place during the day and night. Travelers need to dress appropriately to visit this temple as it is a deeply religious place for the locals here. Malaysia is a tropical paradise and the country is blessed with a rich biodiversity which is evident in this bird park. There are more than 3000 species of birds spread over 20 acres of land. Great place to hang out for bird watching. Kids will love this place. You can even feed a few birds here! Take a walk through this oceanarium with a 90-meter transparent tunnel to come face-to-face with exotic marine creatures. 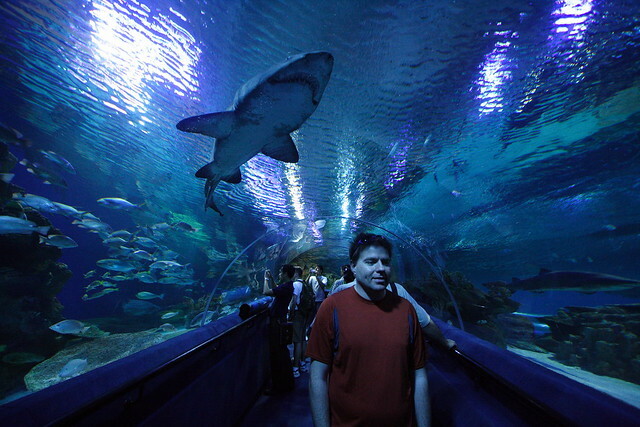 Aquaria KLCC houses over 250 different species and over 5,000 land and aquatic animals from Malaysia and around the world. Open only on Wednesdays, this is a stretch of 2.4 km having stalls selling a variety of street food. This is the shopping and entertainment district in Kuala Lumpur. Best visited in the night to try the local street food, observe street statues, and musical performances. This can be considered as a prime locality with a lot of crowds throughout day and night. As a first timer, this area is a good place to look for accommodations. There are hotels for all sizes of the pocket. Since it is bustling with people, a good place for solo female travelers to stay at. A shopping haven, this brightly colored street with Chinese lantern swaying to the wind is a must-visit. You can get good deals on Chinese herbs, clothes, accessories, paintings, artworks, and more. There is the famous Sri Mahamariamman Temple dedicated to the goddess Mariamman. This Hindu temple is characterized by the colorful tower with intricate designs in it called the ‘gopuram’. Please dress appropriately to enter the temple. Cover your legs and bare shoulders. After that, you can visit Chinese temples like Chan See Shu Yuen Temple and Kuan Ti Temple having Oriental architecture and open courtyards. It is a small area located close to the KL Sentral station and it is filled with Indian restaurants, nice budget hotel, and shops selling stuff from India. You will find a lot of textile and jewelry shops in the vicinity. As the name suggests, this place is for food enthusiasts. 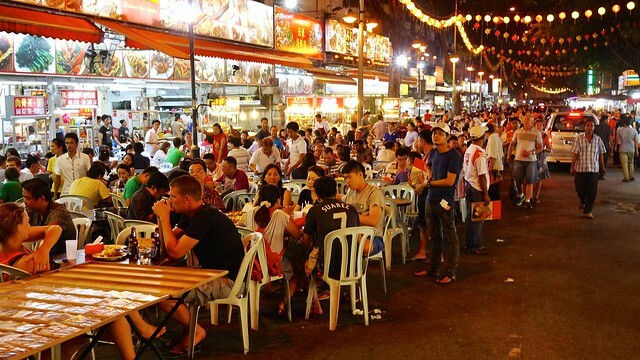 The night markets are open all through the night and you get to savor the best dishes from Malaysian cuisine at good prices. As the sun goes down, crowds start pouring in, residents and tourists alike. You can find tropical fruits like mangoes, guavas, and the famous durian and others. It is the largest collection of the flower garden with the most famous being the Orchid Garden that house 800 species of orchids. A very nice place to hang out in the midst of nature. 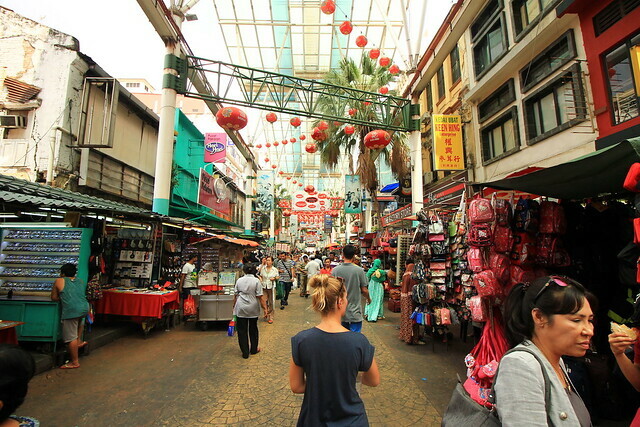 It is safe for solo female travelers to explore Kuala Lumpur all by themselves. There are incidents of pickpocketing, bag snatching, and the regular petty crimes like any other popular tourist destination. In other words, avoid going out late night if you are alone. Just have fun and exercise caution at all times. Please dress appropriately to avoid stares and to be respectful about local customs and traditions. It extremely safe and super fun to take your kids to travel with you in Kuala Lumpur. It is a cosmopolitan city so you have all the conveniences within reach. 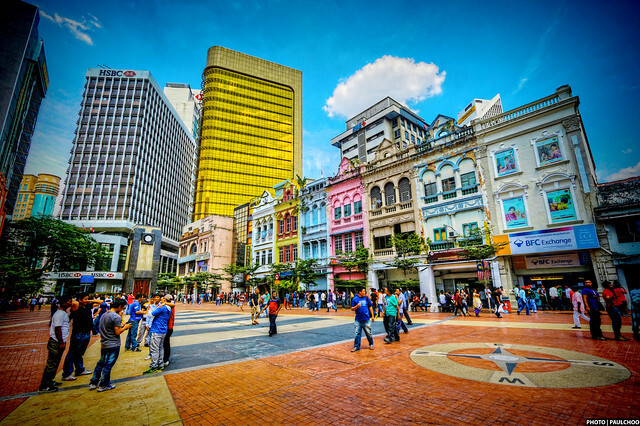 There are good train connectivity and a reliable taxi service, so exploring Kuala Lumpur is hassle-free with kids. The playground in KLCC Park is epic. It's actually several playgrounds all in the one spot, right in front of the Petronas Towers. We had to bribe our red faced, sweat dripping kids away. Check out this travel blog written by Sharon as she travels with her two little kids. She even suggests a list of kiddie places for a family to have fun. All metered taxis quote a higher than average price or have malfunctioning meters. In order to tackle this issue, ask your hotel manager for the average cost of taxi rides well in advance so that you are aware of the actual price. A few eateries overcharge tourists. This can be avoided if you know the average price of a meal. Otherwise, you can ask a local who can help you with the prices. Use ATMs in malls or at places which have a guard 24/7. This is to avoid card skimmers who can steal information from your cards. Cheap electronic goods are easy to find but do not get carried away by the low prices as most of them could be fakes. For instance, look for international warranty or buy from places with good reviews. Pay close attention to the change you receive after purchasing something at a local eatery or at supermarkets. This is a scam where employees try to distract your attention and overcharge you. Be careful about logging into any and every free available WiFi hotspots. Therefore, there are high chances of your credentials getting stolen. For more information, check out this detailed guide and how to tackle the problem if you get into trouble. In conclusion, I hope this detailed Kuala Lumpur travel guide helped you in planning your holiday. Do let us know if we have missed including any important tourist attraction, I would be happy to include for the benefit of other travelers.